Hi everyone! 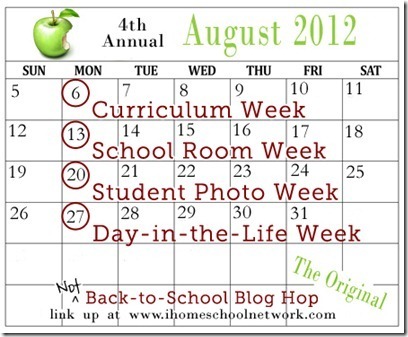 This week is School Room Week with the iHomeschool Network Not-Back-ToSchool Blog Hop! We’ve stuck with a similar room setup this year, with a few fun additions! The above picture is an overview of our room, and now we’ll get into the nitty gritty of our setup! Along the big wall in our room is an Expedit 17”x15”x72” shelving unit and an Expedit 31”x15”x58” shelving Unit. 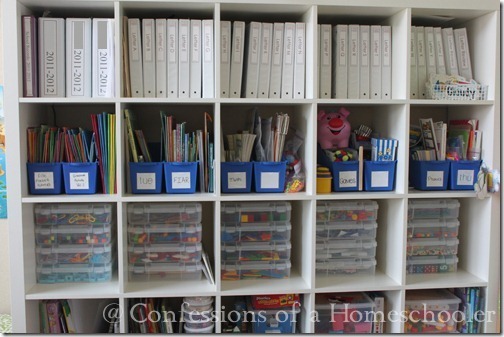 I keep specific phonics and math manipulatives on the top two shelves. These are things we use often and I didn’t want them to get lost in the rest of our things. The shelving unit on the right houses all of my teacher’s manuals. They’re separated by student, so top left is Strawberry Shortcake, right is Turbo, next row is Tinkerbell and Teeny Tot. 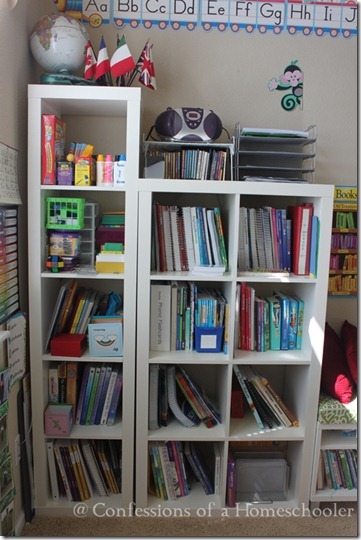 The bottom shelves are teacher’s manuals for subjects we do as a group. Next to the above shelves is our new reading bench. This was a new addition this year that we love! I purchased an Ikea Besta shelving unit with adjustable shelves plus Besta round legs. 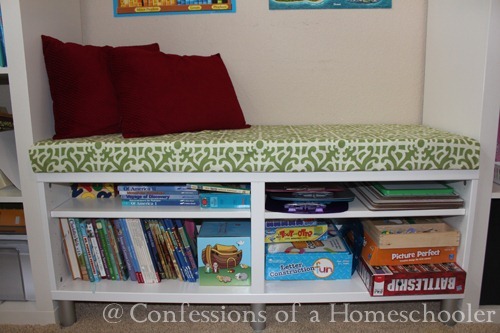 ($50) We made the cute pad specifically for the bench. Stop back by tomorrow and I’ll share a tutorial on this super easy and cute bench cushion tomorrow! The next shelving unit is the Expedit 25 cubbie shelving unit. The top row are all of my LOTW binders and our school work binders. I keep all of their finished worksheets in their annual binders, then at the end of the year, they go down to the basement for storage. 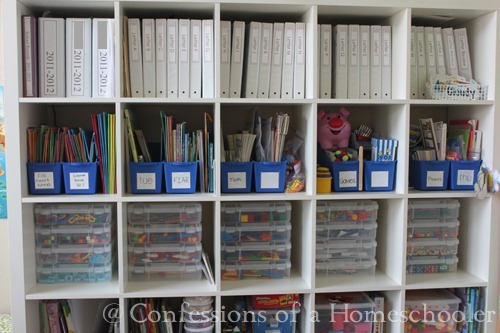 The next row of blue bins are books, lapbooks, then some other miscellaneous games and activities. Mostly for the Teeny Tot. 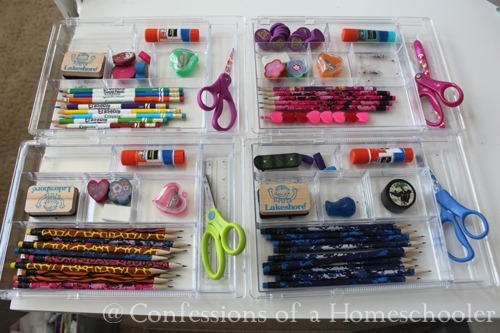 The Blue Organizer Bins are from Lakeshore Learning. The next row are one of my favorites. They are Small (10×11) Clear Document Cases from The Container Store. 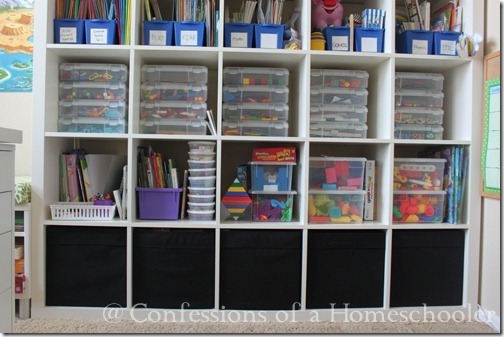 They house all of our manipulatives, math links, alphabet tiles, color cubes, lacing buttons, wooden shape blocks, etc, etc. The bottom two shelves are miscellaneous games, etc. 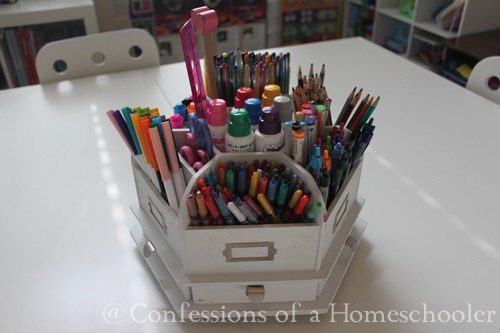 Then the bottom is full of DRÖNA Boxes ($4.99) that house puzzles, wooden blocks, coloring books, etc. If you’re curious, each cube is 15” deep x 13” high and 13” wide, so there is a LOT of space in these! Here is the whole wall for you to see, or as much as I could fit into one photograph! Here is the wall to the right of the shelves. 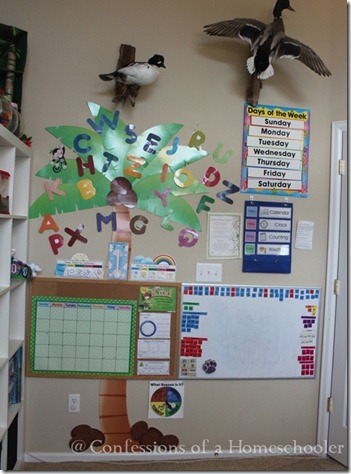 It has our Alphabet Palm Tree, calendar time bulletin board, and All About Spelling board. Along with a few ducks my husband hunted. 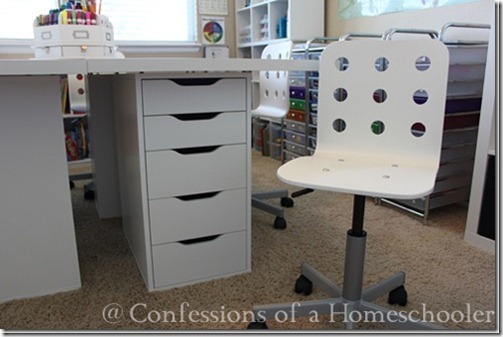 Another new addition is the Micke Desk in white ($69.00). 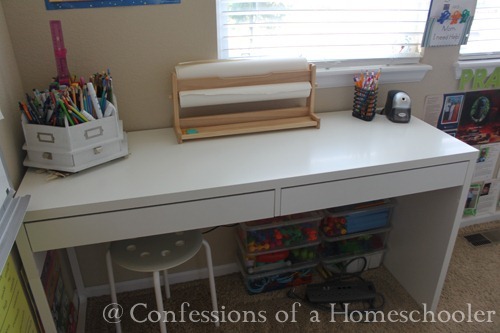 I needed something for the kids to do typing and piano on, plus a workspace for me as well. This one was a great addition because it’s not super deep, but its long. On the desk is a Bosch pencil sharpener, one of my favorite things! It sharpens like nothing else and at record speeds! 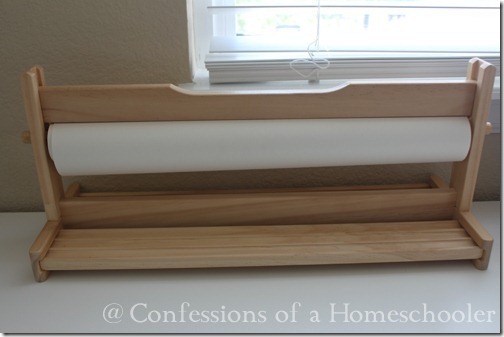 We also have the Mala Tabletop Paper Holder ($6.99) which is awesome! Drawing Paper Roll refills are are $4.99. We kept our Ikea Desk setup. It survived the whole last year and still looks great! Whatever it’s made of is really easy to clean and has held up well. There are some dents on the sides of our swivel chairs just from banging into the table tops, but otherwise it’s held up really well and I’m very pleased with it! I will have a detailed post on how this is put together tomorrow! In the center of our desk is this super cool Making Memories Caddy was one of my old scrapbooking items. I dumped out the supplies and filled it with markers. 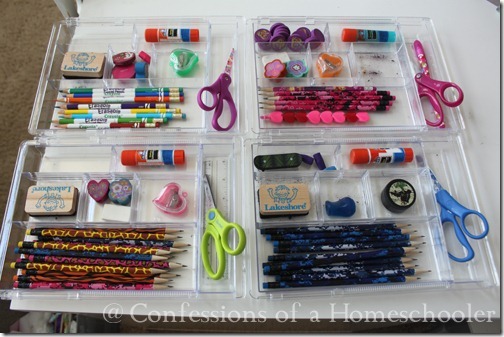 Yep, you know you’re a homeschooler when you start sacrificing your scrapbooking supplies in the name of school. Beautiful room! 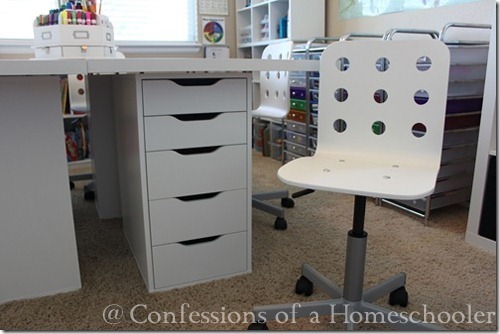 I’m drooling over all that pretty white furniture…. Wish we had an IKEA near us. 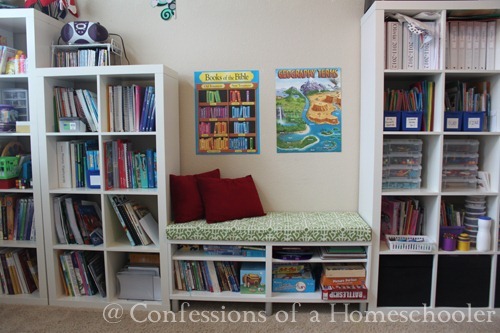 I like your reading bench and might have to have my hubby make me one – it would allow us to get rid of bulky beanbag chairs. 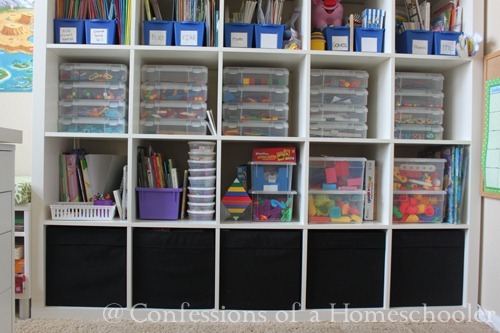 The wall cabinets you use are so practical, we have some in our toyroom. By the way, I clicked on one of your links, for the four-tall unit and I think you might want to check this. Seems as if they are both the same link. Thanks for the links, makes my shopping easier! Blessings! I love the newest additions! You are so creative. 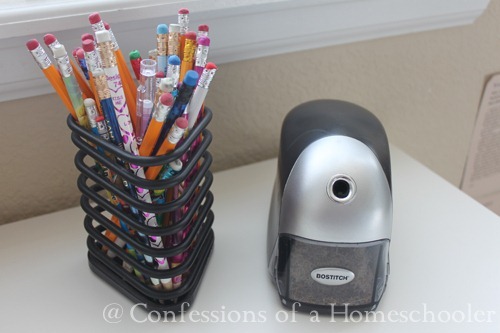 I agree, the Bostitch sharpener is awesome! 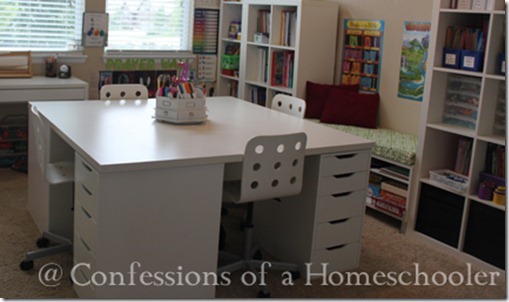 Love your schoolroom!!! How do you get your kids not to continually talk to each other at the table while they’re suppose to be working? We have a table in the middle of our schoolroom also that we were using until recently, because I had to split the 4 of them up so they would get their work done without all the talking. Any advice would be great! They do talk some, but it’s usually not to the detriment of their work, so I guess it hasn’t been a huge problem for us. I used to make them go to another room to read, but now they sit on the new bench. The issue I had was if they went to work in another room they would be messing around instead of working! 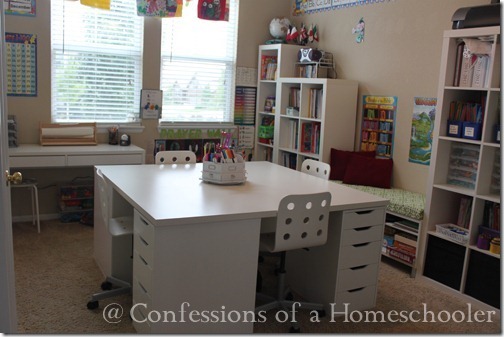 Love, love, love the room…can’t wait until one day mine will be as organized as yours! 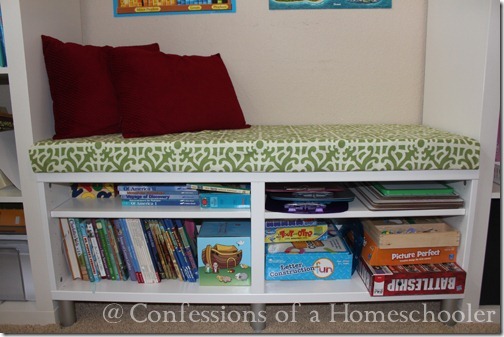 Love the new reading bench. Your kids do piano at that desk? That threw up red flags to this piano teacher. By the time you place a keyboard on the desk, those keys are very high off the floor and you need a VERY high stool for them to sit on (or maybe have them stand). Their forearms should be perfectly parallel to the floor when they play, otherwise the mere act of striking a key is a challenge (read: more work, less fun), the risk of wrist injury is great, and frankly you’re establishing a horrible hand position and technique that will take years of time with a really good teacher to correct. Please consult with your children’s teacher, invite them to see your setup, and ask for pointers to establish the most conducive practice area. And if any of your children really seem to enjoy piano, please, PLEASE consider purchasing a touch-sensitive digital or acoustic piano. Off my soapbox now. Your homeschool room IS beautiful, fresh and inviting. 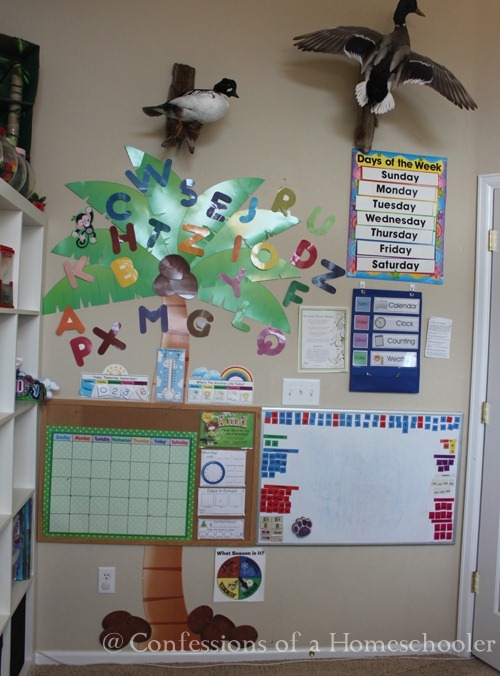 Congratulations on putting together a wonderful space for learning in your home! Thank you for the information, I did realize it was too high after putting our keyboard on there so I purchased a stand. Now it’s sitting next to the desk area. Unfortunately most of the stands are also for adults so it’s still almost as high. For now I’ve opted for a taller chair, so their feet are not on the ground, but honestly I don’t know what to do for it to be kid height? Any suggestions? Great start, Erica! Ideally, you would add books or cushions for the children to sit on to bring them up to the correct height (forearms parallel to the floor). Then provide a foot stool that will enable them to have their body weight forward and supported by their feet. In my studio I use the 12″ foam fatigue mat squares that are readily available in either children’s safety supply catalogs in a variety of colors or gray is available for garage/utility area floors. These cushions allow for a custom fit to both the bench and the foot stool and aren’t too slippery to sit on. You’ll find wiggly feet will shift them off a foot stool, though! Great start, Erica! Ideally you’d add books or cushions to bring the student’s seated height up to have those forearms parallel to the floor. Then provide a foot stool allows them to balance their weight on their feet evenly with their seat. In my studio I use the 12″ square foam anti-fatigue cushions that can be purchased in a variety of colors from children’s safety supply catalogs or in less exciting colors in garage/shop sections of stores. For my littlest students I also use them on the foot stool as well. They are comfortable and not slippery, although wiggly feet will knock them off the foot stool fairly regularly!